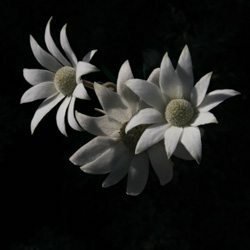 Flannel flowers are a native plant with the species require excellent drainage and prefer a position protected from strong winds as they tend to be a little brittle. Actinotus helianthi or ‘Flannel Flower’ (picture right) is found widely around Sydney and is in fact the centenary flower of NSW also know as the ‘Federation Star’. Flannel Flowers are a spring to summer flowering plant growing to about 40 – 80cm depending on conditions. The soft white hairs that cover the foliage gives the plant a soft ‘woolly’ feel, hence the name, but the hairs are in fact a way of keeping the plant cool and retaining moisture. Cultivars include ‘Starbright’, ‘Parkes Star’ and the long stemmed ‘Luck Star’. Grow in full sun to part shade in a well drained soil, these perennials are well suited to grow in an Australian themed ‘rock garden’. Plants can be cut back to maintain shape and improve flowering. Flannel flowers make a good potted plant. Try not to disturb the root system while transplanting. Flannel flowers will self seed if flowers are left, they are pollinated by native wasps, good air circulation will help prevent disease.